Discussion in 'iPhone and iPad Games' started by AggroMagnetGames, Nov 11, 2014. 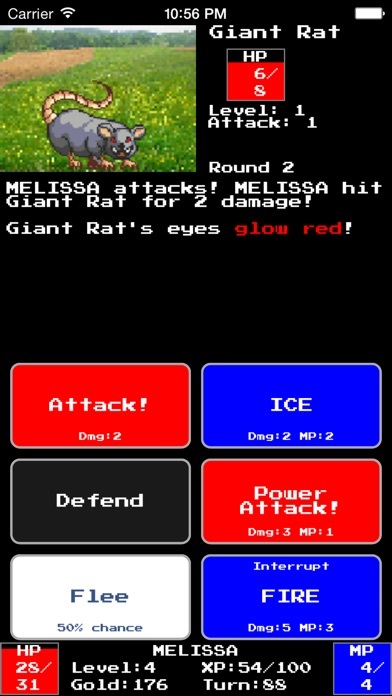 Vigil RPG is an old-school-style turn-based RPG designed and developed exclusively for the iOS platform. Take on the role of a lone female or male hero, on an expansive quest to discover the cause of the appearance of marauding bands of goblins and monsters.  Created by a one-person development team with a design goal of maximum fun -- NOT maximum monetization! Vigil RPG does not, and will never, feature IAPs, ads, or timers. You get the full game, including all future content updates.  Tactical combat that's actually interesting to play! 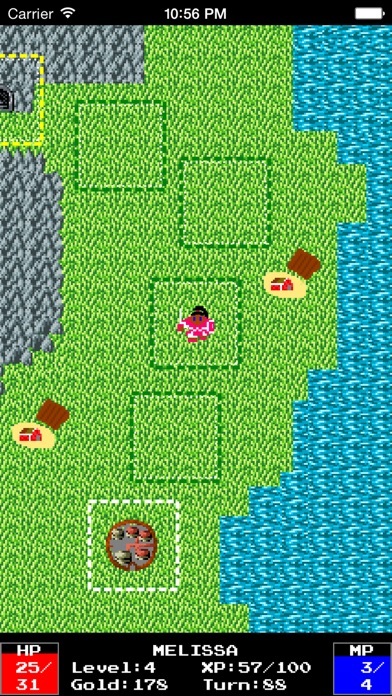 Every enemy has unique attack patterns for a clever and observant player to overcome.  In-game rewards as well as GameCenter leaderboards that reward skillful play, not grinding!  Fast-paced combat! Select an action and launch each combat round in a single tap. Each round takes about a second to play out. Zip through battles quickly against easy enemies, or take time to consider your strategy vs. tougher foes! 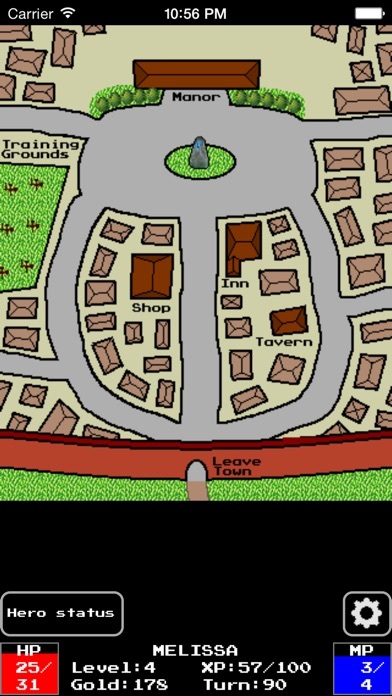  NO frustrating iOS on-screen D-pad common to console-port RPGs! All hero movement is via easy and precise tap controls designed especially for the touchscreen platform.  NO console-style manual game saving needed; the game is always automatically saved! Quit at any time -- even mid-combat -- and the game will always pick up exactly where you left off.  Designed in portrait orientation for easy one-handed play!  63 GameCenter achievements to earn! Hi, TouchArcade! I'm the developer of Vigil RPG (Jonathan Schneider). Vigil RPG was just released on the App Store earlier today (Tuesday 11/11/2014). If you have any questions about the game, please post here and let me know! Thanks! I got a crash when I was trying to switch out the ice spell for something better at the training grounds. Ideas? Congrats on release did you do it all yourself? programming, art, sound etc? always nice to see these indie rpg games! Unfortunately, and very embarrassingly, that's a a legitimate bug that I let slip through to production! The good news is there's a simple workaround while I wait for version 1.0.1 to be approved: Buy a spell power item (an amulet) at the shop in town. After that, you should be able to swap out the ICE spell with no problems. All of the programming was done from scratch by me (Jon). It was all done in the Objective-C language, using a used Mac Mini bought on eBay; Vigil RPG being a hobby project (not a job), that's all my budget would justify! Most of the enemy art is CC-BY licensed stuff from http://opengameart.org. A full list of contributors are in the game's credits (accessible from the title screen). I'm really grateful to those artists for making their art available for indie developer use! I'm not a composer, so the music is likewise CC-BY or public domain licensed, from a variety of sources, also given in the credits. Most of the sound effects for the game I generated myself using two free online tools: as3sfxr (for generating short 8-bit-like sound effects) and PulseBoy (for generating short bits of GameBoy-like music). I did do some of the art for Vigil RPG myself -- mostly stuff which needed to be unique to the game, such as the town map, the world map, and most of the in-game story cutscene images. Paint.net on Windows was the tool I used for image creation/editing. 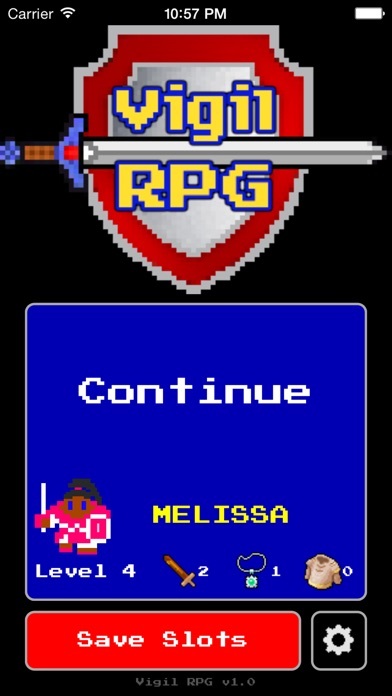 I used the free online tool http://textcraft.net/ to help make the Vigil RPG title page logo. It's very good for a one man game! However I don't think it's "3 dollars" good. It needs content, quests, adventures, side-quests, and maybe puzzles, but as of now, it is a very enjoyable experience and I'm glad I tried it. Sometimes I 'm tired of complicated and extensive games and I want fast , not too complicated games . I have tried a lot but I do not really find my liking. This game is fun , addictive. I'm still in the beginning, but this game is definitely promising. For now, four stars but definitely a pleasant playing experience. Just on the merits of using a Mac mini to create this, I salute you and will check out the app. I have a hobby Mac mini myself... congrats on the release. It never ceases to amaze me which kind of games nowadays people thing would justify the fortune of 3 dollars, to make worth the money spent. Thanks very much! I've historically been primarily a Windows developer, so it was interesting to get to know the Mac platform firsthand during this project. Edit: ok it's on it's way! I am using a retina iPad mini!!!! Thanks, anabolicMike! If you have any questions, please feel free to ask! Yes, the early Dragon Warrior / Dragon Quest games -- in particular, the original Dragon Warrior 1 for NES -- were absolutely a heavy inspiration for Vigil RPG. In particular, with regard to the art style, and the solo hero / 1-hero-vs-1-monster combat mechanic. Yes, the early Dragon Warrior / Dragon Quest games -- in particular, the original Dragon Warrior 1 for NES -- were absolutely a heavy inspiration for Vigil RPG. In particularly, with regard to the art style, and the solo hero / 1-hero-vs-1-monster combat mechanic. Had a feeling . Loved that on my nes waaaaay back. I certainly appreciated the design around that. And the save feature in this game was a great idea. Thanks! That's one thing I found myself annoyed by when I played the iOS ports of Draqon Quest 1 and 4: Do we really still need fixed save points (even given a desire to be faithful to the original game)? So I coded Vigil RPG to just always save your game, automatically. The hero art style and animation is definitely a strong homage to that old NES Dragon Warrior game, though, by design! Once I'm level 8, game crashes when I start to load the savegame of that level 8 character. Tried a few times, restarted from scratch but once level 8, game crahes when loading. D1vi8, thank you for the report -- I'm really sorry about that! I've had one other report of a similar problem from another user (who got his character into the low 20s before having the problem). If would possibly be willing to send me a copy of your save file so I can see what's going on, that would be enormously helpful. I'll send you a PM.